A safe that has been cracked via drilling. Safecracking is the art of opening a safe without the proper key or combination. The process may be either non-destructive or destructive depending on the techniques used. 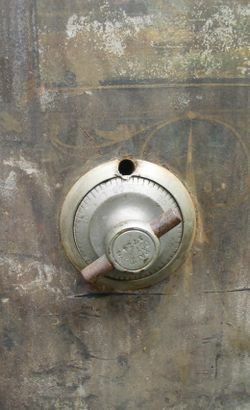 While commonly associated with combination safes, non-destructive safecracking includes non-combination locks, as well. Safecracking is frequently used by locksmiths, safe technicians, and locksport enthusiasts. Like lockpicking tools, the legality of owning, making, or selling safecracking tools varies by country, state, and province. Please see legal issues for more information. Most non-destructive safecracking focuses on defeating the lock on the safe, either through manipulation or bypass. Manipulation may take the form of lockpicking, impressioning, or decoding. Because of the popularity of combination locks, manipulation is most commonly associated with decoding of the combination through touch and sound. See also Lockpicking, Impressioning, Decoding, and Bypass. Manipulation of combination safes involves using sight, touch, and (to a lesser extent) hearing to determine the correct combination to open the safe. The process involves diagnostic tests using the safe dial to assess the correct position of each wheel within the lock. Because manipulation simulates the normal action of the combination lock it is considered surreptitious entry. Auto-dialers (or robot dialers) are computer controlled machines that brute-force the combination of a safe. Auto-dialers may either test the entire set of possible combinations or take into account the tolerances of the lock to reduce the search space dramatically. Auto dialers may also test factory default or predictable combinations given the model of the lock and personal information of the owner(s). Auto-dialers are generally considered surreptitious, but the mounting of the device onto the safe dial may leave forensic evidence. Vibration is applied to the dial of a combination lock to force the wheel gates to slowly rotate to the proper position. This occurs because of the weight difference between the wheel and the gate. Vibration quickly became problematic on military naval vessels where vibration was a natural part of the environment. Most modern combination safes are now designed so that wheels are properly weighted to prevent this attack. Radiological safecracking focuses on using special tools and devices to view the safe in various methods not normally discernable by the human eye. Radiological attacks are generally surreptitious unless easily detectable forensic evidence is left behind. Penetrating radiation (beta ray, gamma ray, neutron beam, ultrasound, X-ray) is used to reveal the correct positions of internal components. This approach is most commonly used to find the correct position of wheels in a combination lock. Wheel made of low density materials, such as nylon or polyoxymethylene (Delrin), are used to frustrate this kind of attack. Thermal and ultra-violet imaging is used against push-button or keypad based combination safes to reveal heat/UV residue on points recently touched by an authorized user. While this technique may not directly reveal the combination, it can drastically reduce the search space to a handful of potential combinations. Drilling is the most common method of destructive safecracking. In drilling, one or more holes is drilled into the safe in order to destroy the locking bolt, the lock cylinder, or allow viewing of internal components to aid in lockpicking or decoding of the lock components. The addition of relockers in some high security safes prevents drilling attacks. The relocker is a device that, if triggered, prevents the safe from being opened even if the correct key or combination is entered. Relockers typically trigger due to vibration, concussion, heat, or the breaking of a physical barrier, such as a pane of glass. Explosives are used to damage or remove hardplate material, locks, relockers, bolts, and door hinges. Explosives are historically popular but use has dwindled with time as more advanced relocking mechanisms have become commonplace on high-security safes, limiting the effectiveness of targetted explosives. Modern explosives are still capable of compromising any safe, but are not as widely used because of the possibility of physical injury and collateral damage. The popularity and effectiveness of drilling techniques have also helped to reduce the use of explosives. Impact may be used to fracture or destroy the safe's barrier material or locking mechanism in a variety of ways. Dropping the safe from a high altitude. In combination safes, the dial is removed and the dial spindle is impacted to cause the wheel pack to break through the casing. Most modern safes have a default relocker to prevent this. Repeated impact to the locking bolt causing it to deform, shear, or weaken. A high speed grinder, saw, or similar tool is used to cut through barrier material, hinges, or, if exposed, the locking bolt. Like drilling, these methods are particularly effective against safes that are not classified as burglary resistant. An axe is used to break into the barrier material and a crowbar or similar tool is used to peel the barrier material away. This technique is rarely effective against modern safes and is extremely time and labor intensive. A crowbar or similar tool is used to pry apart the door or side of the safe. Unlike peeling, prying actually tears the safe open, rather than peeling off barrier materials. This attack is also time and labor intensive, but is somewhat more effective than peeling against modern safes. Safecracking is frequently portrayed in television shows, films, and literature. As with lockpicking, the tools or techniques used are often inaccurate. Namely, the use of a stethoscope, or counting the number of clicks made by dial rotation. Stephenson, Neal (1999). Cryptonomicon. ISBN 0380788624. Feynman, Richard P. (1997). Surely You're Joking, Mr. Feynman!. ISBN 0393316041. Hamilton, Steve (2009). The Lock Artist. ISBN 0312696957. This page was last modified on 27 October 2011, at 06:08. This page has been accessed 441,234 times.